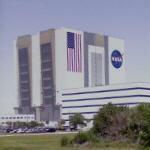 The Vehicle (originally Vertical) Assembly Building, or VAB, is located at NASA's Kennedy Space Center. It is the fourth largest building in the world by volume. The building is halfway between Jacksonville and Miami, and due east of Orlando on Merritt Island on the Atlantic coast of Florida. The VAB is the largest one story building in the world, and was the tallest building in Florida until 1974, and is still the tallest building in the United States outside an urban area.